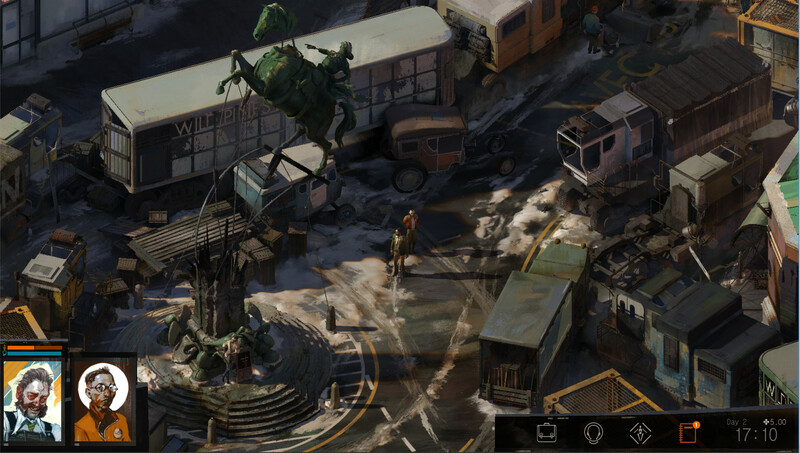 I knew I was going to like Disco Elysium, because people I trust told me I would. And I did very much enjoy the first spin wash of vomit on the laundry of alcoholism that is being the lead character in this detective-em-up RPG. But I felt that I had still to unlock what was special about the game. This happened when I played it for the second time, on the EGX show floor last week, because the second time I played Disco Elysium I found my missing shoe. The first time I played I only found the first one. So you could say that the other shoe… confirmed an expectation I’d been waiting for. 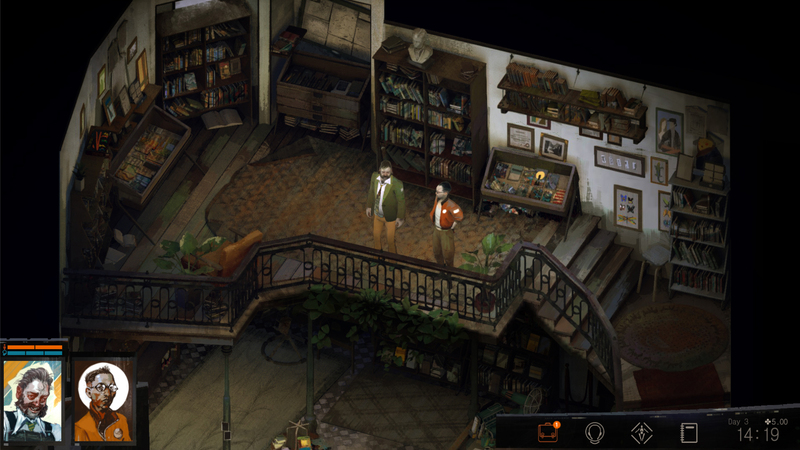 In Disco Elysium you’re an amnesiac alcoholic detective trying to solve a murder. Big picture stuff. This big picture is sketched out by a lot of text, and a world that looks like an oil painting (because the art lead has a background in oils, not games). 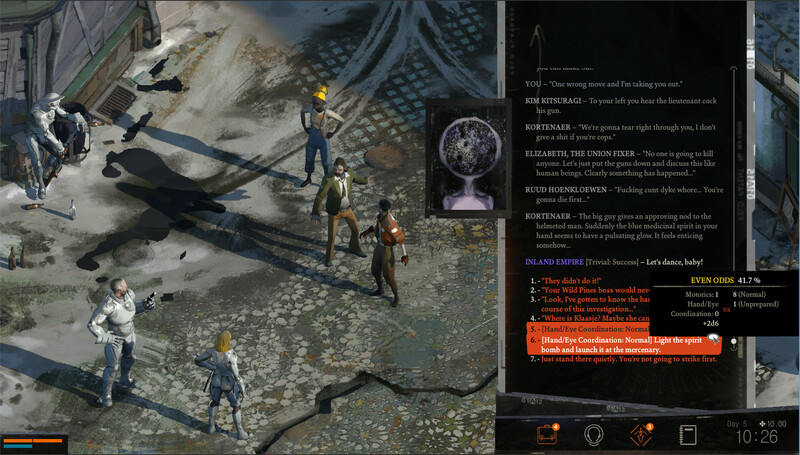 Your character build sees you distribute points across four categories of skills: Intellect, Psyche, Fysique, and Motorics. Intellect covers stuff like Logic and Visual Calculus, Psyche is more imaginative stuff like Empathy, Fysique is Endurance and, y’know, how hard you can punch people, and Motorics is yer Perception, Reaction and Hand/Eye Coordination. These manifest as thoughts your character has, suggesting what he wants to do, giving more context than just a list of options available to you. It’s possible, and I know it is because I played with three different builds, to have entirely different playthroughs, and follow entirely different routes through the game. A character with more Fysique will have more punching solutions to problems, for example. And the more points you put into any of these skills the more likely it is that you won’t be able to ignore those thoughts when they arise. They become compulsions. They become just who you are. You may have heard all this already, of course, but “God is in the details” and “the devil is in the details” are also both famous sayings (the latter feels more apt for Disco Elysium). It’s the details that got me. When the other shoe dropped it gave my character a buff, or, at least, removed a debuff from walking around with only one shoe on that I didn’t even know existed. This was how I discovered there are secret objectives in the game. They won’t show up until you do them, but they’re there. A bunch of them, too, ‘cos I found a load just in the show preview build, and I will not spoil them. You might not even get the shoe one, because one time I found my shoe, but the other time the shoe wasn’t in the same place. Instead, I found my tie. I didn’t know I had a tie until then. This game has layers. Peel another one back and find more: when I played as a more imaginative detective I saw only that the bar’s menu board had been wiped clean after MONDAY; when I played as an intellectual I noticed details about the handwriting. I found a girl outside a book shop and she told me it was cursed. Her mother said she was lying. I tried to break through a mysterious locked door in the back room, but could not. Neither could I persuade the mother to open it. That door consumes my thoughts. I spoke to two old men playing boules in a crater left over from an old war they’d fought in. I roundhouse kicked a giant man. I failed to assert dominance over a horrible child who was high on drugs and throwing stones at a body. If Disco Elysium were a cake it would be a 20 layer Schichttorte and Mary Berry would be bloody loving it. Caution is a virtue, though, and it’s true that the buzz around this game is approaching the ferocity of a swarm of killer bees. But one seems to have gotten stuck in my bonnet. Ah ha ha.